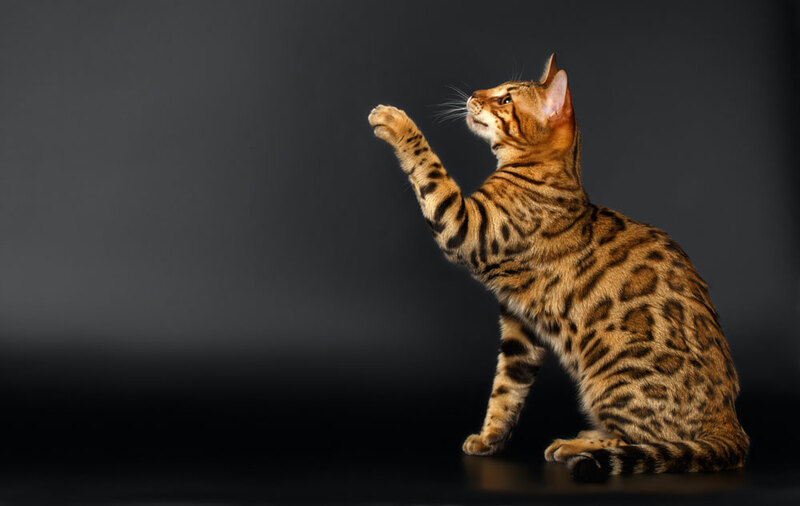 The basic aim of the Bengal cat is to mimic the appearance of the Asian Leopard Cat, however, Bengals do come in a variety of colours and patterns. At the very simplest level, Bengal cats come in two different patterns and two different background colours. The pattern is either spotted or marbled, and the background colour is either brown or white. White Bengals are referred to as ‘snow’s’. Bengal spots come in a variety of shapes, sizes and patterns. Some have many small spots, whilst others have fewer large spots, which is considered quite desirable, though there is nothing wrong with a Bengal with lots of spots! The ‘basic’ Bengal spot is solid colour and roughly circular, however, many breeders aim for producing more ‘wild-looking’ arrow-head shaped spots, or ‘rosettes’ which vary from simply two-tone spots to ‘full’ rosettes with a part circle of spots around a distinctly lighter centre.